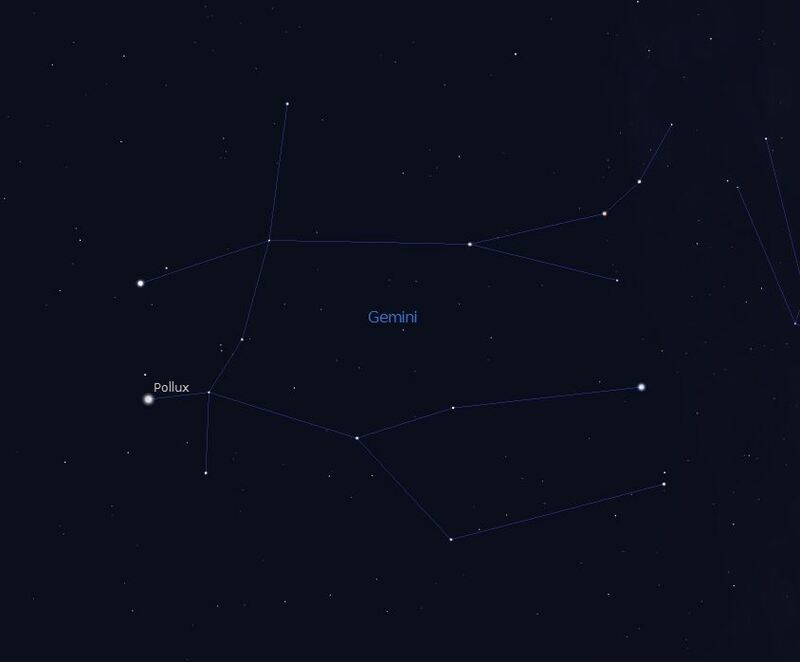 The stars of the constellation Gemini create an elongated rectangle, in which the constellation’s brightest stars – Pollux and Castor – can be found in the most north-eastern corner. From here, the lines of the constellation move in an easterly direction to complete the bodies of the twins, while both twins bath their feet in the Milky Way. The Constellation is typically best viewed during the winter months around 9 PM on the southeastern horizon. Easily spotted, one can first find Orion, thereafter gazing to the northeast to find its two bright stars. The Moon can even aid you in orienting yourself in order to find the constellation. Since mid-January the Moon will temporarily obscure the view of Gemini, rising in the east directly in front of the constellation before moving across the night sky. The more southern star, Pollux (also called Beta Gemiorum), will be 1.1 Magnitude brighter than it’s sister star. Its light reaches us within 34 lightyears, while the light from Castor first reaches Earth after 50 lightyears, whose brightness is 1.6 mag and in actuality is comprised of several double stars, Castor A, B and C. Within Gemini (how could it be different in a constellation of this name) a number of other double stars hide, such as Epsilon Gem, 38 Gem and Mekbuda, a.k.a. 43 Gem. Should you be in search of many stars in one area, you can be pleased. The star cluster M35 is home to more than 200 stars and is easy to see with the naked eye, appearing as a bright nebula. If you have binoculars handy, recognizing the individual stars should be no problem. If you want to impress, use a telescope to view M35, which will reveal the cluster in all its glory. With a telescope with an aperture of 100 mm, you can find the planetary Nebula NGC 2392, which will appear as a blue-green disk. With an even better telescope, you can recognize is exact shape, which the nebule can thank for its name Eskimo or Clown-face. The most well-known event, which arises from Gemini, is the Geminid Meteor Shower, whose peak occurs mid-December. 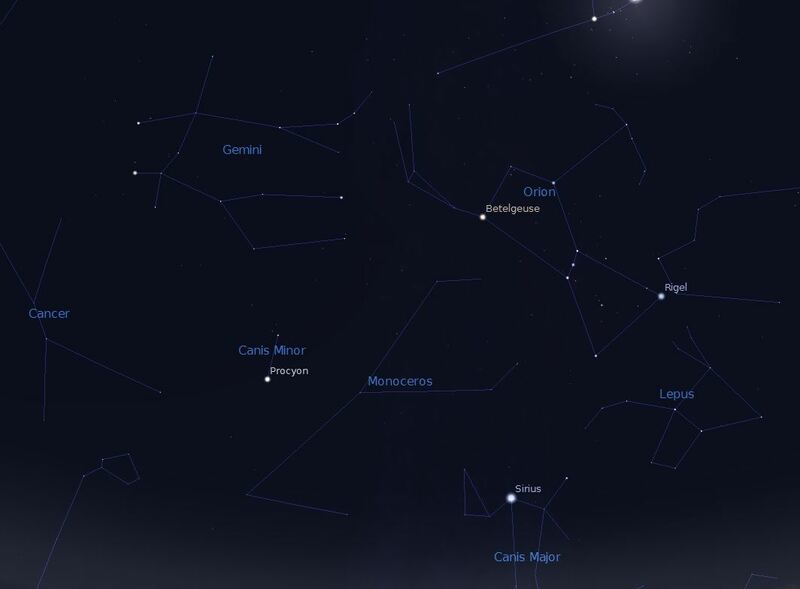 Something lesser known, the Rho Geminids, can be viewed until the end of January. The twins Castor and Pollux are the sons of Leda, but are of different fathers. While Pollux is the son of Zeus, being thus immortal, Castor has no divine connections. His father, Tyndareos, was the king of Spart. However, the two were inseparable and experienced many heroic adventures together. In the end, Castor was slain in battle, consequently descending to the kingdom of the dead – Hades. Pollux, the immortal, grieved his brother and begged Zeus to be allowed to descend to Hades. Zeus, moved by the show of brotherly love, allowed Pollux to spend half the day with Castor in Hades and the other half in the heavens. There, one can see the two of them as the constellation Gemini.